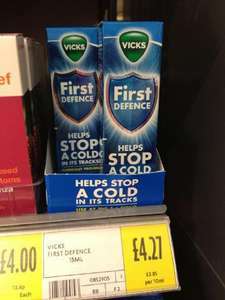 I swear by this stuff, I've been using it for a few years now and have never had a cold since I've been using it! I don't expect this deal to go hot, but if it helps a few, it was worth posting. I tend to catch colds twelve months of the year, so I'll take your advice and try this. Have some heat. Have you got kids at school or playgroups? There's no better way to bring germs into your house! I suspect most colds are not caught up noses. I doubt this stuff would work. Get a Neti pot instead. I tend to catch colds twelve months of the year, so I'll take your advice … I tend to catch colds twelve months of the year, so I'll take your advice and try this. Have some heat. You have to catch it early, usually when you start to feel irritation in your throat, it doesn't work if your nose is already running. i have just returned from the chemist with this £7.50, oh well hope it works. it tastes vile so it must be good. does the neti pot work frank hovis? i was reading about these recently! Have you got kids at school or playgroups? There's no better way to bring … Have you got kids at school or playgroups? There's no better way to bring germs into your house! I suspect most colds are not caught up noses. I doubt this stuff would work. Get a Neti pot instead.